Dr. Sophia Edwards-Bennett has been proudly accepted as “Best in Medicine” by the American Health Council, in recognition of her outstanding work in the healthcare industry over the past 13 years. A firm believer that medicine allows her to positively impact lives on a daily basis; Dr. Edwards-Bennett dedicated herself to her profession, after her mother instilled in her the credo that success is borne from unwavering passion, dedication and service. Her mother also shared the philosophy that “greatness is achieved by never accepting that you are great enough”. After gaining her PhD from Georgia State University, she obtained her MD from Weill Cornell Medical College of Cornell University. She completed her one (1) year preliminary internship at St. Vincent’s Hospital at New York Medical College. She then pursued and completed her Radiation Oncology Residency Training at the Memorial Sloan Kettering Cancer Center. 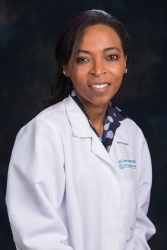 Dr. Edwards-Bennett, known to all her patients as Dr. EB, has practiced at multiple cancers centers, both academic and private practice: including Moffitt Cancer Center, 21st Century Oncology, and currently at the Cyberknife Center of Miami. While practicing at 21st Century Oncology, she consulted, evaluated and treated over 1500 cancer patients. She also joined their Oncology International Team, and synchronously employed her training to disseminate cancer education to the Caribbean, including her native country, Jamaica. She utilized several modes to educate and serve the Caribbean populace: scientific symposium/conference presentations, radio, television, medical news articles, and by volunteering oncologic treatment consultations and recommendations. Most recently, she served as the Senior Radiation Oncology Consultant in the launching of two (2) new Radiation Centers in Jamaica. Dr. Edwards-Bennett has served as the Principal Investigator in multiple clinical studies, and has been awarded research grants, authored multiple peer-reviewed articles, served as a reviewer for journals including Cancer, presented at Medical Conferences both National and International, served on DHEC, The South Carolina Cancer Control Advisory Committee, and as Co-Chair of the Breast Cancer Committee. She is currently an educational journal contributor serving on the Membership Committee of the American College of Radiation Oncology (ACRO), and recently served as the Chair of the Lung Cancer Committee in a collaborative project of the NCCN and CAOH (Caribbean Association of Oncology and Hematology) to construct Harmonized Guidelines for Cancer Detection, Treatment and Follow-up Care in the Caribbean. She is Board Certified in Radiation Oncology, and is licensed in multiple states including Florida, South Carolina, Indiana, Wisconsin and South Dakota. She has been the recipient of multiple awards, including Vitals Patient Choice Award, Vitals Least Patient Waiting-Room Time, Leading Physicians of the World Award, Top Doctor in Florida and South Carolina Award (since 2015), and Who’s Who WorldWide Professional of the Year Honors Award in Radiation Oncology, 2018. Dr. Edwards-Bennett is a member of multiple organizations including the American College of Radiation Oncology (ACRO), The American Society for Therapeutic Radiology and Oncology (ASTRO), The Association for Minority Radiation Oncologists and The Caribbean Physicians Network of CTCA. Looking toward the future, Dr. Edwards-Bennett is enthusiastic and grateful for the opportunity to continue to be an Ambassador of cancer care, education and support services (ACCESS-EB) to her patients, both nationally and internationally. She also hopes to expand her current philanthropic endeavors both in the US and the Caribbean. When she is not indulging in patient care, Dr. EB treasures spending quality time with her family-at home, playing/watching tennis, or traveling. She enjoys writing and is also an avid reader. Established in December 2003, the CyberKnife Center of Miami is the first CyberKnife center to open in the Southeastern US and the 11th in the country. World-class physicians are specially trained in stereotactic radiosurgery and are among the most experienced and qualified worldwide.